A mixed bag of nominations, as usual. But I do kind of like how the widening of the Best Picture field democratizes the competition a bit, even if some of the slots were wasted on some pretty undeserving films. My reaction after the jump. Best Actor and Best Actress nominations are no surprise... at all. I applaud the nomination for Matt Damon in Invictus in the Best Supporting Actor category. If you recall from my review of this underappreciated film I believe his performance is the most important reason to see the movie. Maggie Gyllenhaal for Best Supporting Actress? She wasn't bad. But that role in Crazy Heart was so stereotypical it didn't really allow her to venture much past "Meh?" territory. And how can anyone justify nominating her, Penélope Cruz (Nine) or even Anna Kendrick (Up in the Air) over the more deserving Mélanie Laurent for her movie-hijacking performance as Shosanna in Inglourious Basterds? What the hells is The Secret of Kells? Hurrah for The White Ribbon in the Best Foreign Language slot AND Best Cinematography. The Blind Side and District 9 for Best Picture? Anyone who had any fears that Star Trek or The Hangover might make it onto the list this year care to tell me how these other two picks work out any better? On the plus side, A Serious Man made a much stronger appearance on the list of nominees than I could have hoped. Whatever creative or political baggage Avatar carries with it, from a purely technical aspect of filmmaking it certainly deserves to be up there. So a big raspberry to all the naysayers. Stephen Lang sould be in the best supporting actor and he should win why else see avatar? I totally agree with you rant on the Best Supporting Actress category. Perhaps they didn't put too much thought into it because it seems that statue already has Monique's name on it. I too was pleasantly surprised by the addition of the Coen Bros. movie; however, I think that is one of the films that "snuck" in thanks to the added five slots. Although with the ridiculous momentum of The Blind Side I guess I shouldn't be shocked by that and be more shocked that they included Tarantino's film. It doesn't matter because it's so obviously a two horse race between Avatar and The Hurt Locker. I haven't seen Precious but it seems like an odd choice for best editing. I'm happy to see Richardson get nominated for Best Cinematography for IB. Again not having seen The Blind Side I can't comment on Sandra Bullock, but I just can't tell from what I've seen that she deserves it over someone like Carrey Mulligan or Gabourey Sidibe. But since when were the Oscars ever about rewarding films or actors that deserved something. 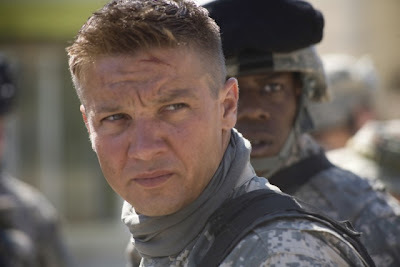 Very happy to see Jeremy Renner nominated, as well as Collin Firth. Also, I like that Matt Damon was nominated for Invictus as he was one of the best things about the movie. I sure hope Christoph Waltz wins because no performance was better all year, regardless of category. I was glad to see In the Loop get recognition for at least something...I wish Peter Capaldi would have gotten the nomination he deserved, though. Finally...is it mandatory now that Meryl Streep be nominated every year. I'm surprised Streep 2.0 Amy Adams wasn't nominated for the same film as this breaks her ridiculous young streak of being nominated. I love Streep and always will...but it's getting ridiculous that she gets nominated for something every time she slaps on a wig, a prosthetic of some kind, and an accent. To Kevin, I totally agree with your comment about Streep who keeps getting recognition come awards season for films that otherwise don't deserve it. What's particularily disheartening is that her Julia Child was basically more of a simple imitation than acting. Agree with you and Tony that A Serious Man is a pleasant suprise despite the fact that it has no chance of winning. I haven't seen Invictus, but do either of you think that Matt Damon was better in it than in The Informant, a film I personally loved. I'm not going to really go any further into this as I've already written it out in full over at my blog, so I'll just provide the link and let the debate continue from there. They also overlooked Almadovar for the first time in years. And I share your heartbreak over Melanie Laurent. I would have liked to see Stephen Lang too: three good performances this year in films that didn't deserve him: Goats, Public Enema, and Avatar. ...and sorry, but Avatar was good, but - like Titanic - it's just not best picture quality. I feel the same way about Up and Up in the Air, but there was no way in hell they'd nominate my favorite Anti-Christ for anything. And I thought Robin Wright was excellent in Pippa Lee, but there's no way they'd take the chance that Sean Pean would have to read her name. Awkward. And thank god 500 Days of Summer and The Hangover didn't get nominated for their good but not great screenplays. That would have been embarassing, but not as embarassing as an Avatar screenplay nom. I saw The Messenger screenplay nom coming from a mile away. It's very chatty and the characters use the maximum number of eloquent words in order to express themselves while leaving the actors plenty of silent "moments" for sobbing on camera. Pure Oscar-bait. Pretty good Oscar-bait, but bait nonetheless. A Serious Man, however is des fruits de mer. Yes, Stephen Lang should win for something, but not this year. I want him to stay hungry and win something for his next performance. It'd be a waste tohave him nominated this year only to lose to Waltz. Kevin, you're right about the additional noms in the Best Picture category, but I believe if they continue this tradition it might prove more interesting in years to come. And call me an idiot but I was wholly unimpressed with Carey Mulligan's performance in AN EDUCATION. Like Gyllenhaal's it just seemed like she was lobbed an easy pitch with that type of role. And you guys lay off Meryl, she's an Oscar insitution (which is my way of agreeing with you). I wouldn't say Damon was any better in INVICTUS than in the THE INFORMANT. He was equally good in both, but the former's a straight dramatic portrayal and the latter is a broad comedic one. To Anonymous #2: I liked Almodovar's film a lot, but it didn't strike me as original enough to merit a nomination (says the guy who is fine with AVATAR'S nod; by the way, I would have had a good long laugh had AVATAR gotten a nod for original screenplay). And I think ANTICHRIST is too immature to deserve even an ounce of the attention it has received.